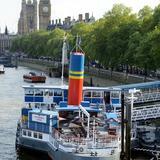 "The PS Tattershall Castle is a 1930's paddle steamer permanently moored at Victoria Embankment here in London. This iconic venue which within it's own right belongs to the rich tapestry of British Maritime History is not only a floating Pub & Restaurant, it's also a great place to book a party or corporate event. With 5 bars & a nightclub, we also have regular award winning comedy in our Steamers Nightclub every Friday & Saturday night. So if it's a drink in the sun on board from either our Fore & Aft Deck Bars or a bite to eat in our Ward Room then we are the place to visit. Check out our private function area "The Bridge" for small gatherings or meetings. Our Lounge for a more intimate setting. Don't forget to check out "Steamers" our largest "Below Deck" spaces for up to 250 people. With great views of the London Eye, County Hall, Southbank & Big Ben we are here rain or shine 52 weeks of the year. We also have the best views of London's NYE Celebrations. Check out our website & social media pages for up to the minute info & "Whats On" here at the Tatts!" By sending this booking your details will only be sent to Tattershall Castle and will never be shared with other third parties. By clicking this box you agree to the Terms and Conditions set out above. You can book to reserve an area of Tattershall Castle for you and your friends. Just enter your requirements below to see what they have to offer. Nightclub strictly 21+. ID may be required. under 14s allowed until 19:00 on the top deck and lounge bar (no views of the river from the lounge bar). 14 years and over are allowed until 19:00 anywhere in the venue. What did you think of Tattershall Castle? Tattershall Castle is dreadful. It took half an hour to get served at the bar and the Tattershall Castle staff were rude and lazy. Avoid like the plague. I had a blast at the Tattershall Castle. We had a work function that was very messy. The staff were great, they just kept everything coming. Tattershall Castle is a great venue and something completely different. The food is not bad either. Agree with the below reviews. A lovely place to while away an afternoon, with excellent views and good food! Could easily spend all day here watching the world go by. If your in the area, it's a definite must! Tattershall Castle has definitely benefited from its refurb! A good place for the summer (they’ve got an outside area with barbeque) with quite a nice family atmosphere. Tattershall Castle is a decent little pub. There is no better place to sit and watch the world go by!! the other side of the river is the London Eye, just in front is Big Ben and you are on the boat enjoying the sun and cocktails. This is worth the walk to visit and is down as perhaps one of the best views of London without having to be up 50 floors in the Shard! I was lucky enough to have a business meeting on the Tattershall castle. 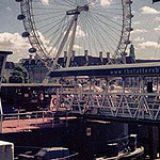 It is a beautiful boat moored in one of the spectacular places in London, from the deck you can see the London Eye, Big Ben and the tourists sailing up and down. I had lunch there, it was a sort of paella with chicken, prawns and chirizo with a little Piri Piri kick to it. The food was beautifully served and was extremely tasty with what my colleague described as "man portions! "this must be one of the best venues to see the fire works at nye! Thanks for a lovely day and I would highly recommend a visit! Great place to enjoy a sunny afternoon. The gentle swaying of the Thames abates after the second or third pint and looking out over the river has a surprisingly calming influence. That's the feeling I got trying to organize an event. They don't give and take to make customers happy, with room fire £100, and own bartender £100, 30 ppl buying buffet £13 PLUS the whole evening of 30 people drinking, would not include entry into the club. Which is suppose to be lame anyway. One of my favorite drinking spots , ruined when planning an event here. Beyond useless and not helpful at all. Slow response to queries, which don't answer your questions, and an attitude like they are going us a favor by spending our money there. Not sure, I even want my Saturday afternoon pints there anymore. Great venue, run by idiots. I have been going to the Tattershall Castle for years & highly recommend it, especially when the sun is shining! Always has a great atmosphere & let's face simply the best location!! I also recently hired the Bridge function room for my 30th Birthday party. Which Arguably has one of the best views in London. The staff were all excellent & considering it's excellent location the room hire, food & drinks were all very reasonably priced! Had a fantastic night. Highly recommended. I went there for the lazy Sunday dinner promotion. The staff are nice but the food is terrible, the presentation was baaaadddddd. The food was also cold. For dessert I had an apple tart and ice cream, the tart was straight from Iceland and served cold not even room temp. The ice cream was as if it had been left in a freezer for years, it was icy not creamy. Do not go there! Visit recently...place packed and a really great friendly atmosphere. Went from the deck when the sun went down into a brilliant comedy night downstairs at the club! what more do you need!! A couple of friends and I went to the comedy night on the boat and it was a really good laugh. The acts were brilliant. Only downside was that is was quite warm and stuffy in the room. great night overall and turned into a disco after....would go here on a normal night out. It was a warm atmosphere and the burger I had was ok - although they were stingy on the chips. However, things took a turn for the worse when I ordered 'American Pancakes' for dessert '. What I actually got was one small pre-frozen pre-packaged pancake from Tescos. When I took a bite, it was still frozen ! When I complained, the waiting staff were not helpful. The manager gave me a refund in the end. But I would not recommend the Tattershall castle to eat in. Certainly if you don't want to die from food poisoning. We went a comedy night at Tattershall Castle which was pretty average. It was fairly basic comedy that failed to have us rolling in the isles. Not a bad nights entertainment considering the low price however. Although I would recommend leaving once the comedy has finished - the Tattershall Castle nightclub is lame! Tattershall Castle is a great place for a night out standing on the deck right on the river. Drinks are quite cheap and Tattershall Castle good for new year too cause it's right by Big Ben. After a very pleasant visit to to the Tattershall Castle yesterday, I realised what a lovely way it was to while away an hour or two there. The Tattershall Castle is a fantastic place for large parties. We had great fun. They played good music but the attitude of the bar staff was shocking, they were so rude! They didn't seem to like serving customers at the Tattershall Castle in my opinion, it felt like we were a hindrance. 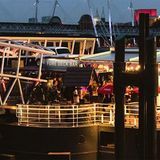 On a hot summer’s evening what could be better than hitting the decks of river-bourne venue Tattershall Castle and imagining you’re on a sea cruise off the Mediterranean. It may be moored, but with the river lapping gently against the sides of the barge, drinks tastes all the sweeter – and don’t forget the nightclub on board! 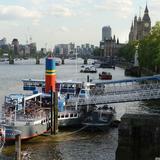 Moored on the River Thames, not far from Embankment Tube station is the Tattershall Castle barge. The interior is reminiscent of a 1980s cruise liner, but to be honest the decor isn’t the main draw of this floating pub. This vast vessel has five bars and an upper deck where you can enjoy a glass of chilled wine and watch the river traffic cruise by. There are breathtaking sights of the city with the London Eye located opposite alongside Big Ben and panoramic views of the London skyline. There’s even a nightclub available for hire (capacity 250 people) with regular club nights each week. People always seem to get excited when they go on a boat, and Tattershall Castle is no exception, with a definite holiday atmosphere reflecting this illusion. The lunch hours tend to get very loud as it’s frequented by local office professionals all in pinstripe suits probably discussing last week's rugger at Twickenham. This changes at the weekends when groups of out of towners visit to let their hair down and party. Club Tattershall is open for business midweek and at weekends and makes for an interesting twist on the usual club experience. If you want to dance to all the club classics come on a Friday from 9pm–3am and Saturday is the Boat Party night – ideal for hen parties and stag nights. The food at Tattershall Castle is pretty decent with a nice choice of pub grub. Starters range from £4.50 for a black pudding, with main courses consisting of chicken caesar salad for £6.75, or burger and chips at £8.25 – so it’s hardly going to break the bank. If you’re just after a sandwich, prices start at £4.75 and sharers from £7.45 for a mix of bruschetta and olives. Desserts are also available from £4.65 with tea and coffee if you fancy something warm to drink. There are all the usual beers, wines and spirits available and the prices are reasonable, but there isn’t anything you couldn’t get from your local pub. 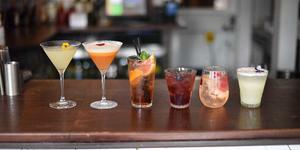 Let’s face it, you’ve not come here for the variety of booze, and don’t worry, there’s plenty of it! Tattershall Castle comes highly recommended, especially during the summer months. What could be nicer than spending balmy evenings on the river?